James in his MUFON paper focused on the possibility that stories of the Roswell crash may have been disinformation issued to fool the Russians into thinking we might have recovered secret incredibly advanced technological devices. They would then waste time seeking information about these mythical craft. He also suggested that perhaps Kenneth Arnold’s famous sighting of a fleet of 9 very high speed (over 1200 mph when the speed record was about 675mph) craft over Washington state on June 24, 1947, two weeks before the purported Roswell crash, might have also been a disinformation plot.I believe anybody reading Dr. Bruce Maccabee’s review of that case would disagree. I am definitely in agreement with James that disinformation is a very important aspect of hot and cold war activities. Certainly New Mexico is no stranger to disinformation and intentional misinformation. When the extraordinary first nuclear explosion was set off at Trinity site on the White Sands Missile Range on July 16, 1947, at 5:29AM, it was seen by people as far as 100 miles away. Many calls were made to Sheriff’s offices, police forces, etc. In a few days a totally false story was released indicating that an ammunition dump had blown up and that fortunately nobody was injured. It was only after the nuclear detonations on Hiroshima and Nagasaki, Japan, on August 6 and 9, that the true story came out. The city of Los Alamos, NM, where the scientific work connected with the development of those weapons was conducted was a totally secret city. Nobel prize winning scientists travelled under assumed names. And there were many more examples. A very distressing disinformation release occurred on Sept.12, 1945, when the New York Times quoted General T.F. Farrell, Chief of the War Department’s mission to Hiroshima, saying that the bomb produced no long lived radioactivity. That was known to be totally false as a result of medical observations of very sick people in Hiroshima a month after the blast. During World War II there were many examples of Disinformation. The allies made a very elaborate and subtle effort to convince Hitler that the expected invasion of Germany would take place near Calais, France, under General Patton. Instead Normandy was the location. Hitler was fooled and withheld his reserve troops “knowing” that Normandy was just a feint. It was too late when he finally responded. James goes on at some length about a Project Sear supposedly conducted in secrecy by New Zealand, the USA and the United Kingdom towards the end of WW II .The idea was to see if an artificial Tsunami could be created using underwater explosives and causing a huge tidal wave to wash away the Japanese troops on Pacific Islands. He focused on articles appearing in Mid-June 1947 suggesting the project had been working on something as powerful as the atomic bomb and makes much of the timing of one of the articles being in a newspaper next to one about Kenneth Arnold’s sighting. For reasons unknown the articles named 2 professionals involved in the project. James is right to ask what that was all about. Was it to tantalize the Russians? But he provides no link between that story and Roswell or the Soviets. One question he asks is why nobody of the 509th Composite Bomb group at Roswell was punished for putting out the Roswell press release which certainly made them look like idiots not being able to tell the difference between a weather balloon /radar reflector and a flying saucer. Colonel Blanchard, commander of the Roswell Army Air Field, indeed went on to become a 4-star general and Vice Chief of Staff of the USAF. I would suggest an obvious answer. Rancher Brazel came in to Roswell on Sunday, July 6. Major Marcel and Captain Cavitt followed him out to his ranch that day, stayed over night, and came back late on the 7th with more wreckage. Lieutenant Walter Haut was ordered to put out the press release on July 8. That left plenty of time for Blanchard to have been in touch with his boss Brigadier General Roger Ramey over in Ft. Worth. We know from Retired General Thomas Jefferson Dubose, Ramey’s chief of staff, that Ramey in turn was called by his boss General Clements McMullen in Washington to cover up the story which he proceeded to do. Blanchard, DuBose, Ramey and McMullen were all West Pointers. Clearly the process involved the Chain of Command. Blanchard could easily have had the wreckage left by Brazel examined while Marcel and Cavitt were gone. One doesn’t get downgraded for following orders, one gets commended .McMullen was acting head of the Strategic Air Command. Also Blanchard was somehow not available for questions . I was surprised to find that Carrion doesn’t mention the story told by Professor Valery Burdakov of the Scientific Geoinformation Center of the USSR Academy of Sciences in a large article in Rabochhaya Tribuna (the Workers Tribune) in August 1991, Professor Burdakov told how he had been told by Sergey Korolyev, the Soviet Union’s top rocket designer,that Josef Stalin had ordered Korolyev to spend time in secret reviewing a number of foreign articles about UFOs including about Roswell. Several Translators were provided. Korolyev told Stalin the saucers seemed to be real, but were not a security threat to the USSR. Stalin said other scientists had provided the same opinion. Burdakov was asked about the source of the information. His answer was from Spies. We now know, of course that there were, in 1947, Russian spies such as the Rosenbergs and Klaus Fuchs working at Los Alamos. Furthermore, Colonel Blanchard’s daughter Anne had told me many years ago that she had heard from someone who worked at Los Alamos that the lab had received materials from Roswell for evaluation. Certainly the lab obviously met two required criteria for access to such materials:very high competence and very high security clearances. The discussion about Burdakov and Korolyev (sort of the Werner Von Braun of the Soviet Union) appears in my 1992 book “Crash at Corona “(Ref. 3) and is also mentioned by Tim Good in one of his books. James is also concerned as to why in a TOP SECRET document mention is made of Project Mogul. As it happens the notion that MOGUL was very highly classified as claimed by the USAF Roswell debunkers such as the Air Force and Dr.Charles Moore and Duke Gildenberg, is false. Only the mission objective was classified (listening with a constant altitude balloon for possible Soviet nuclear explosions). Many of the Mogul flights were allowed to just come down to earth and left to rot in the sun.. There was usually no chase plane .None of the technology was classified. The US Army Air Force group at Alamogordo Army Air Field actually launched, for the press, a weather balloon radar reflector combination as shown on the front page of the Alamogordo Newspaper on July 10, 1947. It certainly wasn’t anything like a Mogul Balloon train with its 20-24 weather balloons at 20’ intervals. James claims that the failure to reprimand anybody in the 509th is especially hard to understand considering that they were supposedly reprimanded about a classified document that had to be reclassified to a higher level. He shows the reclassification request. I think its is very clearly a standard instruction to reclassify because of a change in security level of the document by the originator and is not a reprimand.. I should certainly agree that the USAF has put out more disinformation about the Roswell Incident than about any other UFO incident. Consider the two monstrous (in size and lack of accuracy in the content) reports “The Roswell Report: Truth vs. Fiction in the New Mexico Desert” (1992 Mogul nonsense) and the “Roswell Report: Case Closed.”:trying to explain Roswell bodies as crash test dummies none of which were dropped until at least 6 years later and all of which were 6’ tall and weighed 175 pounds. Both are loaded with disinformation as I have discussed elsewhere They wouldn’t have fooled the Russians for a minute. They did seem to fool the New York Times and other newspapers which seemed to buy them hook, line, and sinker. James Carrion Ain’t No Sissy! The Roswell craft wasn't even a saucer it was a flying crescent wing and this has already been proven by an eyewitness sketch that is available to anyone who is willing to take the time to look at it. It was a German designed bomber called a German Horten wing that was built in Argentina. Even Wernher Von Braun and Willy Ley at Alamogordo confirmed this. You would figure after 60 years there would anyone intelligent enough to figure this out. Enough is enough. How much longer are they going to play this farce? You can't cover up the fact that they have been building these UFO's here on earth for the last 70 years. Stanton Friedman is a disinfo agent and Corso's book is nothing more than Corso being brainwashed by mind control techniques. Corso wasn't even a witness and was just fed disinformation that he believed was true but was not. Your not fooling anyone. 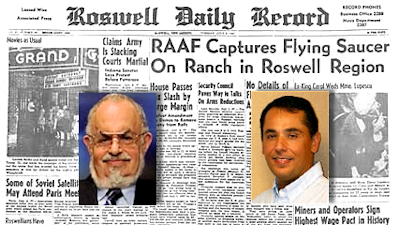 Every time I hear the disinfo about Roswell I laugh because of all the suckers who fall for it.